You can't get much closer to the fruits of the Garden of England than here at WillArch Lodge. Kent is famous for its fruit production, and here you are surrounded by apple, pear and cherry orchards. In fact a few miles away is Brogdale, home to the National Fruit Collection, as well as a fabulous farmers market selling local produce. The Lodge has a lovely gazebo terrace, covered in the summer for shade and with a fire pit for colder evenings. Inside is an absolute treat! The kitchen has a stunning butcher's block dining table, and upstairs is a lovely open plan room stretching the length of the lodge with windows that stream with light and show views of the orchards beyond. 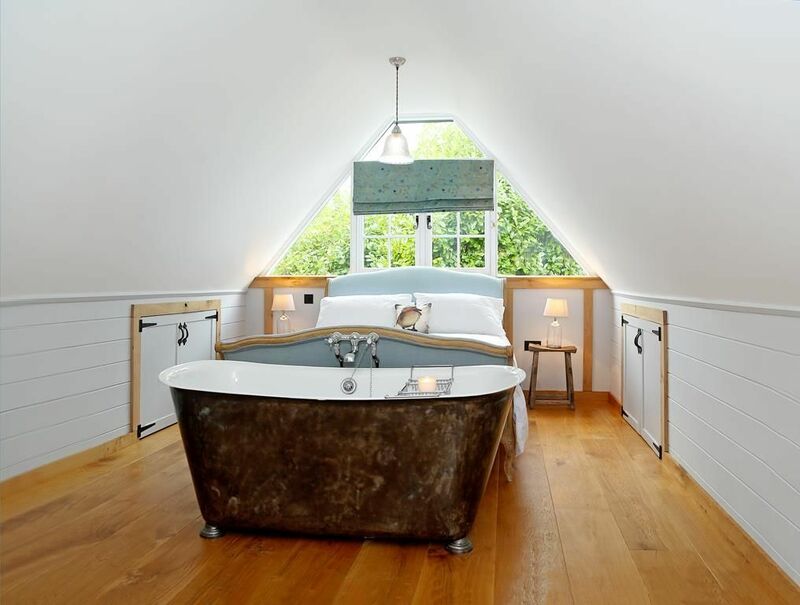 A luxurious Loaf kingsize bed awaits guests, as well as a beautifully restored french bath tub. Whilst this is the perfect romantic retreat for couples, the owners have thoughtfully planned for growing families as well and built bunk beds into an alcove complete with lights and usb ports, great fun for kids. The surrounding countryside has some lovely walks - check out www.faversham.org/visit_faversham/walking for a great selection of circular walks with a foodie theme. All are dog friendly, and suggest pubs that welcome four legged friends as well. The historic market town of Faversham is a short drive, with lovely walks along the creek. The city of Canterbury is close by, for some history and culture, and if all that's not enough, the wonderful seaside town of Whitstable is just 15 minutes away for some sun, sea and of course oysters. The property was a little difficult to find at night. Although the directions were generally clear, the last couple of turns were not easy to navigate in the dark. However, when we arrived all the stress of not being able to find it easily disappeared! It was absolutely beautiful decorated inside. The welcome goodies were a lovely surprise. The bed was very comfy too. It was a very relaxing weekend, just what we needed! Would highly recommend. Thank you. Thank you very much for your lovely review of Alpaca, we are delighted to hear that you enjoyed your stay at at property and hope to see you again. Had an amazing time here whilst staying for study at local college. The house is amazing! Lovely and quaint. My wife and I really enjoyed it. Great facilities and everything you need for a perfect getaway. My wife loved the roll top bath! Also great that is dog friendly and our daschund loved it! Would happily stay again. Muchas gracias por los comentarios. Me alegra saber que disfrutó su estadía en Canterbury y esperamos volver a verla en el futuro. Norton is a tiny rural parish three miles west of the historic market town of Faversham. Nearby villages of Eastling and Newnham offer lovely country pubs.